The small matter of the newly (and ludicrously) formed Copa de la Liga lies ahead but with Racing Club lifting their 18th league title, continental cup qualification secured and relegation decided, the official league season has come to an end. 25 rounds, 325 matches and 719 goals closed on Sunday evening as first played second in a resplendent Cilindro. A deserving Academia crowned champions over closest rivals Defensa y Justicia, still able to enjoy a historic campaign despite falling away in the home straight. With Racing conceding a league lowest 16 and Boca Juniors only two more it is difficult to suggest there are two better goalkeepers than Gabriel Arias and Esteban Andrada. The two internationals with Chile and Argentina respectively were a key part of two of the strongest backlines in the league but there was another number one lower down the table, who consistently caught the eye. There may not have been much fanfare around the signing of Alan Aguerre but Newell’s Old Boys reaped the rewards of the 28-year-old’s agility with a string of superb performances. La Lepra might be fighting off relegation next season and finished down in 15th after Saturday’s draw with Banfield but no side outside the top four conceded fewer goals. An impressive Argentina debut last September was testament to how good Renzo Saravia was this season and the Racing Club full back may well start the Copa América as La Albiceleste’s first choice. Nothing looks quite so damning as to why Diego Cocca didn’t fancy Saravia after the 25-year-old arrived from Belgrano but thankfully Eduardo Coudet saw the light. Sound defensively and a buzzing presence down the right, Saravia was vital to Racing’s success over the past year. River Plate youngster Gonzalo Montiel was also given a shot by Lionel Scaloni after a strong Copa Libertadores winning campaign and Tomás Guidara impressed despite Belgrano’s relegation but there was no better right-back than Saravia. Racing’s previous championship in 2014 was built on a strong defence and after a couple of shaky years, Diego Milito identified two players to solidify things and provide the spine to challenge once more. Alejandro Donatti was excellent but centre-back partner Leonardo Sigali was a rock for Eduardo Coudet and both defenders also provided La Academia with a potent threat at set-pieces. Sigali hit the ground running after coming in from Dinamo Zagreb in 2018, and the Under-20 World Cup winner won back possession almost five times per game and made five clearances on average as Racing kept the best defensive record in the Superliga. It has been a pretty meteoric rise for Lisandro Martínez, who was snapped up by Juan Pablo Vojvoda due to his inside knowledge of Newell’s Old Boys’ academy and brought to Defensa y Justicia on loan during the second half of 2017. In less than two years, the youth team player has become an indispensable starter for a side that has come within a whisker of lifting the title and made his full Argentina debut. Despite his small stature, Martínez is a tremendous competitor and his ability on the ball enables him to play in a variety of roles and systems. Two goals, three assists and countless superb displays alongside teammate Alexander Barboza were a key factor behind El Halcón’s success. Barboza and the rapidly maturing Juan Cruz Komar at Talleres, two examples of young defensive leaders to impress in the Superliga but none more accomplished than Martínez and now the only question remains is how far the 21-year-old can go. Unfortunately for Banfield it is perhaps difficult to imagine Claudio Bravo remaining at the club for any great length of time after a tremendous season will surely have put the 22-year-old in the shop window. El Taladro may have struggled and finished down in 16th, conceding 31 goals along the way but that didn’t prevent Bravo from racking up some truly impressive stats. Averaging well over five tackles and three interceptions per game, the highest in the league in both categories, Bravo’s high intensity defending provided Banfield with real drive down the left. Milton Casco reviving his career with River Plate was instrumental to Los Millonarios’ success in 2018 and Braian Cufré was another of Vélez Sarsfield’s young guns to announce themselves to the Superliga but Bravo was a consistent performer. Still raw and with plenty of room for further development it will be interesting to see where Bravo goes from here. Getting things right in the transfer market was absolutely crucial to Racing Club’s success and amid a number of players to come in and make an immediate impact on the first eleven, none perhaps boosted La Academia more so than Marcelo Díaz. The experienced Chilean international arrived from Liga MX in 2018 for this campaign and provided the security in the middle of the pitch for so many others to flourish. Another on-field leader for Eduardo Coudet to rely on, Chelo was a protective ball winner in front of the back four and an assured first pass forward, managing to maintain a pass success rate of over 90% for the season. Lucas Menossi fulfilled a similar role at times for Tigre, albeit with more of an attacking impetus, as El Matador came within a whisker of avoiding relegation but Díaz was part of the Racing spine that proved critical in lifting the title. Vélez Sarsfield’s academy products rightly took much of the plaudits for El Fortín’s terrific campaign but there was arguably no better piece of business than Gabriel Heinze requesting the signing of Gastón Giménez from Estudiantes for a little over $1 million in 2018. The 27-year-old’s younger midfield companion Nicolás Domínguez could have easily made his way into the Team of the Season too but it was Giménez that provided the glue to hold Heinze’s side together. The deep-lying midfielder with the tactical nous to drop in between the centre halves and allow the full-backs forward is the key to Heinze’s teams and for Vélez that responsibility lies with Giménez. The former Almirante Brown midfielder’s tackling and passing earned him an Argentina debut in 2018 and while that will likely not be a long international career it was just reward for a terrific campaign. Defensa y Justicia’s Domingo Blanco driving runs from deep saw the Independiente loanee take a spot in Scaloni’s most recent squad and while the 23-year-old is perhaps a better bet for appearances in the future, Giménez was outstanding for Vélez. Blanco was just one of the Defensa y Justicia side to impress as El Halcón enjoyed a historic season in the top flight and while Argentina swooned over a fresh batch of midfield hopefuls that may eventually grace La Albiceleste, Sebastián Beccacece relied on a talented Paraguayan. Racing Club’s Matías Zaracho burst forward to great effect en route to the title and is now in Beccacece’s plans for the Copa América and Vélez Sarsfield’s Lucas Robertone had a breakthrough campaign in the pockets of space behind the striker but neither came close to the end product of Matías Rojas. The Cerro Porteño product disappointed at Lanús previously but was transformed under Beccacece scoring ten goals and adding two assists in 21 appearances. Five scored from free-kicks an illustration of Rojas’ wonderful left foot as the 23-year-old finished the season with an international debut. 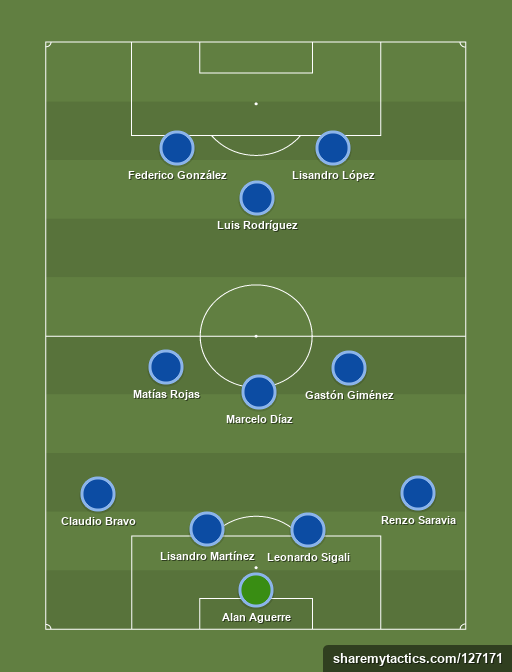 Depending on formation it could be argued that Walter Montillo, whose creativity and goals almost dragged Tigre to a remarkable escape, or Matías Vargas, who played his way into one of Lionel Scaloni’s Argentina squad with a string of dazzling displays on Vélez’s left, are worthy of a spot in the Team of the Season. Both excelled at times during the season but the contribution of cult hero Luis Miguel Rodríguez shouldn’t be forgotten in spite of Colón’s desperately poor season. The wily old Pulga made the surprising switch to Santa Fe in January but even his three goals in eight games couldn’t help the Sabalero turn round what was a dreary campaign and his move also aided Atlético Tucumán’s slip out of the Copa Libertadores spots. Rodríguez, an icon in Tucumán, had struck eight goals and four assists during the first half of the season with El Decano but his transfer enabled River Plate to pip the club to fourth. Ultimately it was all in vain but Federico González produced his best season in front of goal since bursting onto the scene for Ferro Carril Oeste in the Nacional B a decade ago. The 32-year-old provided Tigre with a much needed focal point to the attack and after Néstor Gorosito was appointed manager in the second half of the campaign, he along with Walter Montillo and Lucas Janson almost pulled off the great escape. Eleven goals and two assists in 20 appearances, a tally only bettered by two players, was individual reward for a great season and so unfortunate that it wasn’t enough to stave off relegation for Tigre. Of the two players to score more than González, one was Independiente’s Emmanuel Gigliotti, whose twelve goals in the first half of the season propped up El Rojo prior to his controversial sale to Toluca, and the another needs little introduction. This Superliga season was all about this man – a leader, a goal scorer and a club legend, Lisandro López. Diego Milito returned to the club at the end of his career to help Racing to the title in 2014 but Licha had never tasted glory at the club where his career began. Now at 36, an age when many players have already hung up the boots and hit the golf course, López was determined to end that wait. Aside from his 17 goals in 24 league appearances, López was the on-field general for Eduardo Coudet and inspired those around him. Jonathan Cristaldo went from over-weight has-been to an important strike partner over the first part of the season and his replacement in the starting eleven Darío Cvitanich provided a timely boost in the title run. The fellow veteran adding a vital three goals to the five scored with Banfield and while the likes of Nicolás Fernández (Defensa y Justicia), Cristian Chávez (Aldosivi) or José Sand (Lanús) enjoyed spells of good form, no one came close to the great Licha.